So I originally started this blog with the intention of sharing a lot of my CTMH artwork here, but as you can clearly see I've only posted about family related things three times since November! I guess it's obvious that with 5 kids, I'm quite a busy and sometimes overwhelmed mom, but I really will start posting more cards and other creations here in the near future. So I have a CTMH gathering I'm preparing for tonight and I've come up with two cards to make with my hostess and her guests. The first card (top) is a 4x4 criss cross card (I just love the pull-out tag feature)! I used D1284 With Love (June Stamp of the Month) to stamp the fireworks (it's a flower stamped upside down), as well as D1289 July Word Puzzle, and D1270 March Word Puzzle (for the "happy" sentiment). Colors are Cranberry, Indian Corn Blue, and Outdoor Denim on Colonial White cardstock. 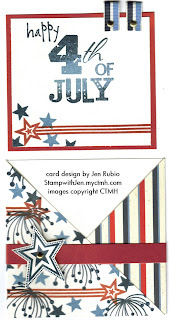 I also used the striped paper from the Blue Ribbon paper pack. 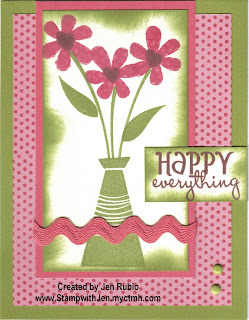 The second card uses D1284 With Love (June Stamp of the Month) and D1280 Spot on Backgrounds stamps. Colors are Barn Red, Blush, Hollyhock, and Olive. Techniques I used here include masking (to make the stems look like they are coming out of the vase) and kissing with the dots background on the flowers. I still have a lot to do to finish packing and prepping for my class tonight, so I'd better go continue preparing for now. I will be back to share more of my creations soon though!